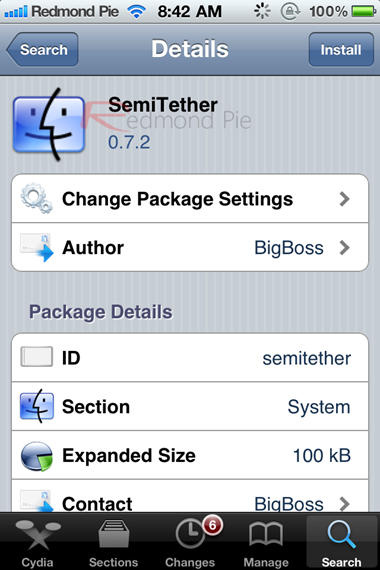 Last week, a new sort of jailbreak for iOS 5 popped up in the form of a Cydia package – named SemiTether – which you could install after performing a tethered jailbreak using Redsn0w/Sn0wbreeze. This package, once installed, would allow users to reboot their tethered-jailbroken iPhone, iPad or iPod touch with limited functionality without having to connect your device to a computer. SemiTether has received a big update today and it is what we’ll be talking about in this post. The update comes from the folks behind the BigBoss repository on Cydia. Numbered v0.9.1, SemiTether jailbreak for iOS 5 now incorporates Jay saurik Freeman’s latest mobile substrate (a framework that allows developers to install patches to system functions) and allows you to use Safari after rebooting into semi-tethered state which was not possible before. More stability with new MobileSubstrate. Patches Safari so it works properly in non-tethered jailbreak mode. Ability to monitor the status of SemiTether jailbreak for iOS 5. SemiTether is now much more stable and solves “all the flakiness problems” that it had in the past. It is also important to note that this software is still in beta stage and users are warned to install it on their own risk. If you aren’t clear yet, SemiTether is a tweak which brings your tethered jailbreak for iOS 5 closer to an untethered jailbreak. Although this goes without saying, you will have to be on iOS 5 and be jailbroken on it in order to install SemiTether. You can follow our guide on how to jailbreak iOS 5 using Redsn0w or Sn0wbreeze. After that, you should follow our guide on how to jailbreak semi-tethered on iOS 5 to take advantage of a “semi-tethered” jailbreak. We are hoping that the developers will make use of those five userland exploits announced at this year’s MyGreatFest for an untethered jailbreak for iOS 5. More recently, the iPhone Dev-Team has shown that they have an untethered jailbreak for iOS 5 which not only supports iPad 2, but also the recently released iPhone 4S. Since there is currently no ETA for a full untethered jailbreak, we will request all our readers to be patient. The jailbreak will come when it is ready. Update x1: iOS 5.0.1 is now available, and it can be jailbroken semi-tethered using Redsn0w, Sn0wbreeze, and SemiTether package from Cydia.